We are committed to providing interactive and dynamic learning experiences for students of all levels. Our process uses a rich mix of online and self-paced instruction, helping institutions effectively engage the audience throughout their training. The model is capable of adapting to the needs of any institution. This includes the evaluation of how effective a learning program has been as well as the assessment of each individual learner. Interactivity is a key component in course development. We pay attention to divide longer learning modules into bite-sized courses and to integrate more interactive elements to make the learning process engaging. We ensure that the social and collaborative learning techniques like online discussions and forums are integrated to the course design. 1. Analyze the learning objectives, audience, course content, method of delivery, and the scope of the project. 2. Following analysis prepare a high-level design document with a clear strategy, design approach, and lesson plan. 3. 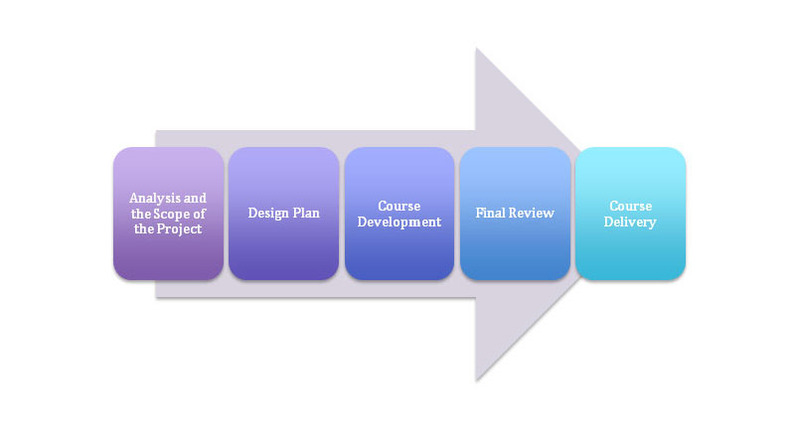 Once the design document and the project plan are approved, the course is developed referring to the design strategy document. 4. Before delivery the developed course will be reviewed by the subject matter experts.